Breakfast. Start your full day visiting the Great Pyramids - Cheops, Chephren & Mykerinos then Visit the Valley Temple The Place where the Priests Mummified the dead body of king Chephren owner of the second pyramid at Giza Platue Also it`s the same place where you Can have a close-up look at the Sphinx - The legendary guardian that stands by the huge funeral complex with its lion body and the head of king Chephren. Then Continue your day tour to Sakkara, located only 27 km southwest away from Cairo. Visit the Step Pyramid (Built for king Zoser), it is considered an important part in the process of the pyramid evolution, which were made from the simple mastaba to its widely known form. (Optional not included) 50 $ P.P & 25 $ Per Child Dinner Cruise including transportation, dinner, Belly Dancer and Tanura Show. Overnight in Cairo. Breakfast. then around 8:00 am pickup from your hotel to start your full day tour visiting the Egyptian Museum of antiquities. It displays the largest and most precious items of the Egyptian art in the world. It exhibits a rare collection of over 250,000 genuine artifacts that date as far back as 5000 years, including an exclusive exhibit dedicated to the TutankhAmon - A collection of treasures, gold, and jewelry that were buried in his tomb for over 3,500 years before they were discovered in the 1920s when his tomb was excavated. Then visiting the Old Cairo that known as Christian Coptic Cairo which is Among the most important locations visited by the Holy Family where the spiritual impact of their presence is most felt still; though their stay was brief, for the Governor of what was then Fustat enraged by the tumbling down of idols at Jesus' approach sought to kill the Child. But they took shelter from his wrath in a cave above which, in later years, the Church of Abu Serga (St Sergious) was built. This, and the whole area of the Fort of Babylon, is a destination of pilgrimage not only for the Egyptians but for Christians from around the world. An air of piety and devotion pervades the whole district there. Also There you will be able to visit and Enter the Church of Abu-Sergah and St. Barbara, the hanging church, and the old jewish synagogue - Ben Ezra Synagogue. (Optional not included) 35 $ P.P Sound & Light laser show at Pyramids area. Overnight in Cairo. Breakfast at the Hotel then early Morning transfer to cairo airport to take your Flight to Aswan Arrival to Aswan, meet & assist by our representatives and transfer to the hotel. Check in. Then at 10:30 am Pickup from your Hotel in ASWAN to Full day Tour Abu Simple Temple the colossal Temple of Abu Simbel built by Ramses II (XIXth. Dynasty) and lately saved from inundation of the Nile waters in among the glories of ancient Egyptian monuments. The temples were built out of a sandstone rock cliff, and representation of the deities to which each was dedicated is carved on its huge façade. Nearby, also saved, lies the small Temple of the King's wife Nefertari, dedicated to the goddess Hathor. This excursion can be undertaken by plane or bus.Overnight in Aswan. Breakfast . Transfer to the Cruise. Boarding before lunch, Visit the High Dam and the Philae Temple. Lunch on board Sail to Kom Ombo. Afternoon Tea. Visit the Temple shared by the two gods Sobek that known Kom Ombo Temple and Haroeris. Sail to Edfu. Dinner on board. Overnight in Edfu. Breakfast on board. Cross to the West Bank to visit the Valley of the Kings, the Temple of Hatshepsut and the Colossi of Memnon Excursion to the Necropolis of Thebes, on the Eastern bank. Crossing the Nile, drive to the Valley of Kings; visit the tombs of various Dynasties, The Temple of Deir El Bahari. 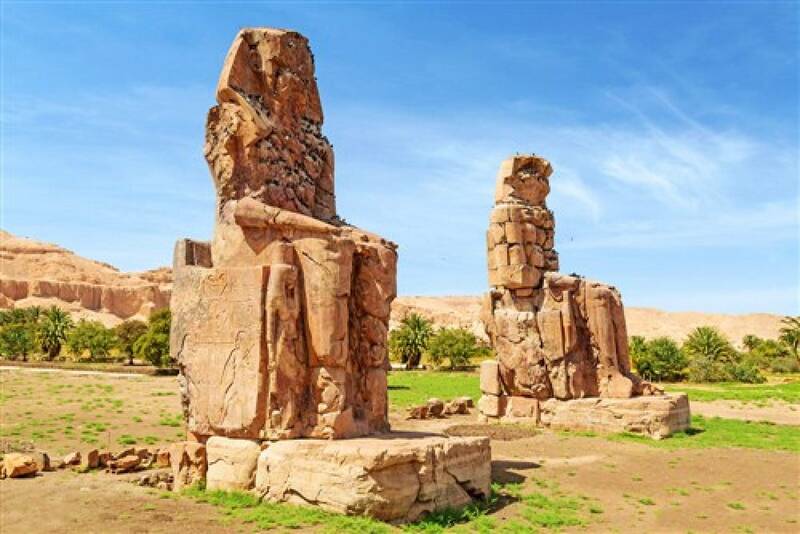 On the return journey stop at the Colossi of Memnon which are two gigantic sitting statues representing Amenophis III facing the Nile and visit the Temple of Queen Hatshepsut. Lunch on board. Afternoon free at leisure. Afternoon Tea. Overnight in Luxor. Breakfast on board. Disembarkation. Full Day Tour: East Bank to visit the Karnak and Luxor Temple Excursion to the Luxor Temple to see its courtyard and the granite statues of Ramses the Great Proceed by carriage or bus to Karnak, which is a serious of temples, built in different reigns. Starting by the Avenue of Sphinxes visit the Unfinished Propylon, the Hypo style Hall with it's 134 gigantic columns, the Obelisks of Queen Hatshepsut and Tutomosis III, the temple of Amon adorned with lotus and papyrus designs, the Granite Scarbeus of Amenophis III and the Sacred Lake. (Optional) 80 $ P.P Hot Balloon: Should you want to make your stay in Luxor an unforgettable. Drifting peacefully over the Valley of King, Valley of the Queens and the Mountain on the Nobles. Breakfast. Departure by flight to Sharm El-Sheikh. Arrival, meet & assist by our local representatives and transfer to the hotel.Overnight in Sharm. Breakfast. & Dinner at the Hotel and Free day on your own . Overnight in Sharm El Sheikh. Our Representative pick up from hotel early morning,drive for approx 2,30 hours, and then you will be transferred to St-Catherine to visit St-Catherine monastery 220 km northwest Sharm el Sheikh and located between the St-Catherine's mounts and Moses Mount which is the oldest monastery of Christianity. It is an Orthodox Greek monastery within its amazing walls rests a citadel like no other, incredibly rich in important religious and historical structures. Among its treasures is a library of ancient manuscripts and icons second only to the Vatican’s itself, and a 6th century church reputed to lie directly on the site of the Burning Bush After that head to Dahab, the Flower Power City in the Red Sea, for a city tour and shopping tours in Dahab. Have lunch at a local restaurant then we will drive you back to your hotel in Sharm El Sheikh. Breakfast at the Hotel Then at 7:00 am Pickup from your Hotel By Emo Tours`guide and transfer by Private A/C Vehicle to Alexandria where it` is 220 k/m away from Cairo. Arrive Alexandria around 10 am and start your day Tour there Visiting The Roman Theater (A theater with marble seats up to 800 spectators, Galleries, Section of mosaic flooring & a pleasure garden surrounded by Roman Villas& baths). Then a visit to The Catacomb of Kom El-Shoqafa (Tombson three levels, also contains the Tri-cilium where relatives used to sit on stone benches to feast the dead, a center with relieves of bearded serpents, Inside are 2nd Century AD statues of Sobec &Anubis wearing Roman Armor). Then visit Alexandria Library & Also from out side you will Visit Qaytbay Citadel & El Mursi Abu Elabas where you can have a free walk on the Cornish . Tour Finishes with drop off at your hotel in Cairo you will be back to Cairo around 19:00 pm. 5 Nights hotel accommodation in Cairo on bed and breakfast basis. 1 Nights hotel accommodation in Aswan on bed and breakfast basis. 3 Nights hotel accommodation in Sharm El Sheikh on half Board basis. 1 Full day tour in Cairo visiting Old Cairo, Egyptian Museum and Khan El Khalili. Free Camel ride in Pyramids area. All your tours and excursions are with Private A/C mini bus.